SAN SALVADOR, El Salvador (Aug. 22, 2013) -- Maj. Gen. Joseph P. DiSalvo, the U.S. Army South commanding general, and Salvadoran Brig. Gen. William Armando Mejia, the Salvadoran army chief of staff, signaled the end of the sixth annual army-to-army staff talks between the U.S. and Salvadoran armies by signing a memorandum of understanding in San Salvador, El Salvador, Aug. 14. Army South, as the Army's executive agent, conducted the staff talks with the Salvadoran army in an effort to create a bilateral forum for strategic-level discussions between the respective armies. The staff talks program seeks to promote professional partnerships and increase interaction between partner nation armies. The engagements enhance army-to-army contacts and mutual understanding, providing the partner nation armies with insights concerning specific U.S. Army programs, areas of mutual interest, and assisting partner nation armies in areas of modernization or reform. "We've had a very close relationship with the Salvadoran army through the years," said DiSalvo. "The purpose of these staff talks is to strengthen that relationship so that we can work together to successfully face the challenges in this region." The staff talks have been instrumental in enhancing the interoperability and cooperation between the two armies, which have contributed to increased stability in the region. Throughout the many steering sessions leading up to this week-long event, the two armies worked to develop a bilateral engagement plan that includes knowledge, capabilities and support for current and future peacekeeping, humanitarian assistance and disaster relief and other combined operations. The result of those meetings produced 24 agreed-to actions that include professional development and subject matter expert exchanges that will take place throughout fiscal year 2014. "The staff talks provide a strategic line of effort between the two armies in order to coordinate the events for the upcoming fiscal years to include subject matter expert exchanges," said Salvadoran Lt. Col. Raul Torres, the Salvadoran army liaison officer to the U.S. Military Group in the U.S. Embassy in El Salvador. "The importance for our group is that we receive all of this knowledge on how to train our soldiers and officers. This forum helps the way we are able to communicate directly army-to-army and enforce the link to provide a stronger partnership." "Strengthening the relationship with the Salvadoran army through these talks will have lasting effects on the peace and stability of the region," said DiSalvo. "With its highly capable military and law enforcement agencies serving as models of professionalism in the region, El Salvador is a key player in enhancing security in the region." In addition to being a key partner in the region, El Salvador has continued to support coalition efforts in the Middle East. "El Salvador has proven to be a reliable partner in the War on Terror," said Maj. Sergio Trejo, the Army South Central America desk officer for El Salvador. "They have deployed more that 3,400 soldiers during twelve consecutive troop rotations to Iraq, and currently have forces deployed to Afghanistan in support of the International Security Assistance Force mission." In addition to the deployments to the Middle East, the Salvadoran army participates annually with Army South and other partner nation armies and security forces in humanitarian, natural disaster preparation and security exercises, such as Peacekeeping Operations-Americas, Fuerzas Aliadas Humanitarias and PANAMAX. Salvadoran Col. Guillermo Enrique Galicia, the Salvadoran G-5 civil affairs director, also believes the week-long staff talks are a crucial mechanism that provides an opportunity to maintain a commitment to support each nation face respective challenges. "Both armies have always supported each other," said Galicia. "When the U.S. has requested, the Salvadoran army has always been ready and willing to provide troops. In addition, the U.S. Army also provides logistic and training support. There has been a long-standing brotherhood between both countries. Together we can solve our problems and united we work better." This past summer, Army South planned and conducted Beyond the Horizon-El Salvador, a humanitarian and civic assistance operation that provided training for both American and Salvadoran military and government personnel, while providing medical, dental, veterinary and engineering support to rural communities in Central and South America. 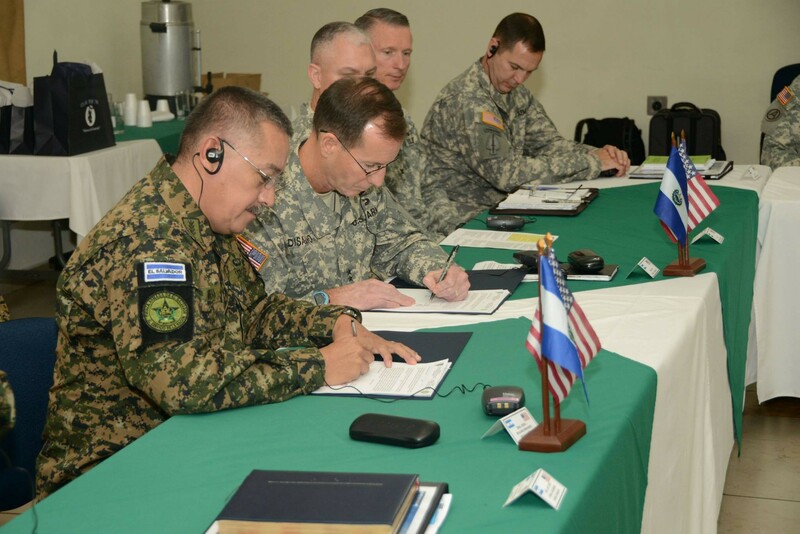 In addition to El Salvador, Army South also conducts annual army-to-army staff talks with Brazil, Chile and Colombia on behalf of the U.S. Army and as part of the U.S. Southern Command's theater security cooperation mission in Central and South America and the Caribbean.